A Douglas B-18A with a redesigned nose. The bombardier was placed forward and above the nose gun position. 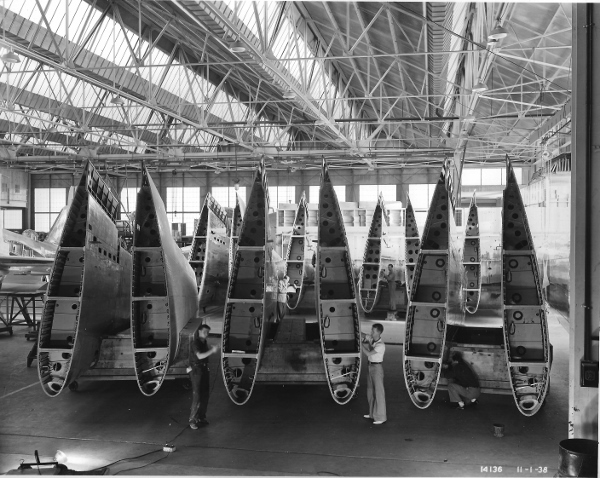 The wing was the same basic design as the DC-2 except the span was shorter by 5 ft. 6 in. (1.68 m) and it was mounted as a mid-wing instead of a low-wing position. The tail surfaces were enlarged and it had a top speed of 216 mph (348 km/h). It was powered by two 930 hp (690 kW) Wright R-1820-45 Cyclone engines driving 3-bladed constant speed metal props. The fuselage was entirely new and it was much deeper than the DC-2 commercial transport in order to accommodate an internal bomb bay and a crew of six. Armament consisted of three 0.30 caliber machine guns in a nose turret, dorsal turret, and a ventral gun below the fuselage. It could carry a bomb load of 4,400 lbs (1,995 kg) in an internal bomb bay. The six man crew consisted of two pilots, navigator/bombardier, a nose, dorsal, and ventral gunner. In the early 1930s, the economic depression and a strong isolationist movement resulted in severe military budgetary restraints and severely limited the procurement of major military weapons. The strategic bomber wasn’t part of the military doctrine at the time and the role of the airplane was primarily limited to ground support for the army and costal defense. Aircraft were not expected to play major role during a war or be a significant factor in the final outcome. Only a few farsighted individuals foresaw the strategic value of aircraft in war time. This rationale was decisive factor in the selection of he competition winner. Despite the Boeing B-17 being faster, able to carry more bombs, and having a longer range, its one major drawback was that it cost 42% more than the DB-1. The Boeing was $99,620, whereas the DB-1 cost only $58,500. Citing the crash of the Boeing Model 299 as an excuse, an order for 133 Douglas DB-1s was placed and the Boeing order was limited to thirteen YB-17s. The decision was widely criticized at the time, as the B-18 was hopelessly outclassed by the time World War II began, but the performance of the early B-17 was also lacking and had to go through major modifications, before it became one of the most effective bombers of the war. 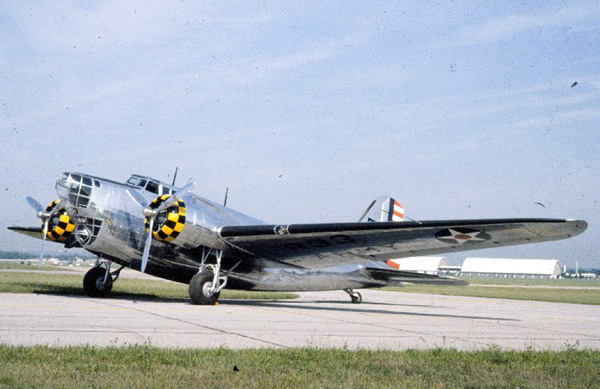 Despite the limitations of the B-18, it allowed for training of multi-engine pilots that would be sorely needed when the B-17 finally did emerge as the weapon of choice for strategic bombing. Following the competition and extensive testing, the DB-1 was returned to Douglas to brought up to production standards and an additional contract was awarded in 1937 for 177 B-18As, and 40 more aircraft were ordered in 1938. Two years after production began, one B-18 was modified to carry an M-1898 75 mm cannon mounted in the bomb bay. The cannon was flight tested over Lake Erie and at the Aberdeen Proving Grounds at Phillips Field, Maryland. The vibration from the cannon proved to be too excessive and the tests were discontinued. Although the cannon version of the B-18 proved to be unworkable, the tests did provide useful data for a similar installation in the North American B-25G and H.
A B-18B converted for anti-submarine warfare. (Photo: Pima Air & Space Museum). The 7th, 5th, 19th and 2nd Bombardment Groups and the 38th and 21st Reconnaissance Squadrons were equipped with B-18s and B-18As. An unusual demonstration was staged in January 1940, when a battalion of troops was ferried by 38 B-18s of the 7th Group. This was the first US experiment with airlifting large groups of soldiers. At the time of Pearl Harbor 33 were based on Hickam field in Hawaii, and 12 on Clark field on the Philippines. Most of these were destroyed on the ground during the attack by Japan. Two B-18As were converted for use as transports and designated C-58, many others were used in this role without being redesignated. Surviving USAAF B-18s ended their useful lives in training and transport roles within the continental USA, and saw no further combat action. Two B-18As were modified as unarmed cargo transports under the designation C-58. Twenty aircraft were sold to Canada and were designated the Digby Mk.I by the RCAF. Two 1,000 hp (746 kW) Wright R-1820-53 Cyclone engines. Three 0.30 caliber machine guns and 6,500 lbs (2,950 kg) of bombs. 1. David Donald ed. The Complete Encyclopedia of World Aircraft. London: Brown Packaging Books Ltd., 1998. 352. 2. Lloyd S. Jones. U. S. Bombers. Fallbrook, California: Aero Publishers, Inc., 1974. 51. 3. René J Francillon. McDonnell Douglas Since 1920: Volume I. Annapolis, Maryland: Naval Institute Press, 1988. 188. 4. Bill Yenne. McDonnell Douglas, A Tale of Two Giants. New York: Crescent Books, 1985. 25.